Newly renovated suite with 10ft ceilings, large windows, new kitchen with stainless steel appliances and granite counters. Incredible new bathroom with double sink granite vanity, separate shower and bath. The suite comes fully equipped with furniture, appliances’ and everything else you need to enjoy your stay in Victoria. The living room has a double pull out sofa bed and a love sofa, 40” plasma TV with digital cable and BluRay/DVD player. 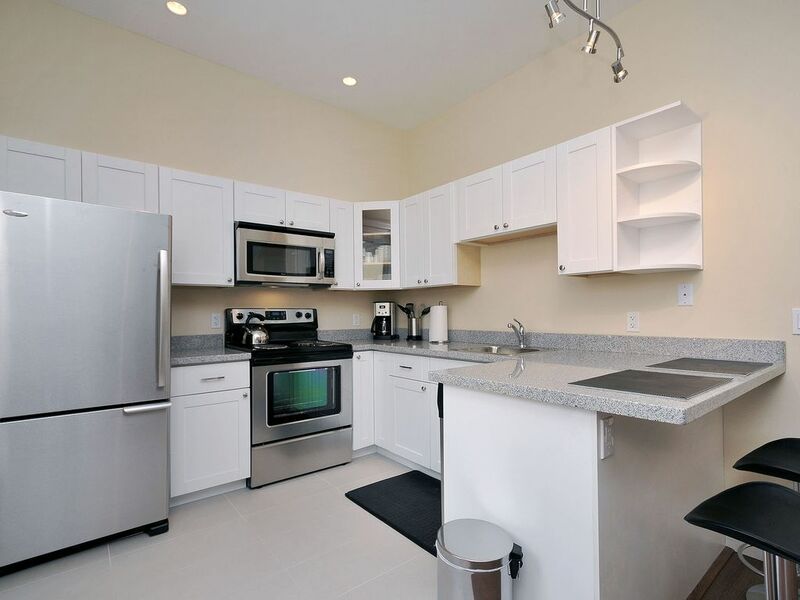 The kitchen has a dishwasher and comes with all cookware, plates and cutlery. In suite laundry in the unit. Fresh towels, linens and wireless internet are all included as well. The second floor was newly renovated to add 2 bedrooms with queen beds, closets and the master has a walkout to a deck area. Our restored character 8-plex is located right at the Rockland/Oak Bay border. This central location is just minutes away to everything: Dallas Road oceanfront, Cook Street Village, Downtown, Oak Bay Village and Fernwood Village. Walk to local attractions, such as Craigdarroch Castle, the Art Gallery of Great Victoria, or shop along antique row, all less than a 5 minute walk away. Grab a bite to eat or shop for groceries right across the street at the Stadacona Center. Bathroom features his and hers sinks, a large tub and separate shower. A eating bar in the kitchen with 2 stools. A dining table with 4 chairs. 2 extra chairs are stored upstairs for your use if needed. There is a very BAD SMELL as you enter the Building thank god the apartment did not smell like that. Also the two sinks in the bathroom was a nice touch but the one on the left is plugged. Also there seemed to be a problem with the parking stall we were told to use I had a note left to tell me that it belonged to 1471 Building. There as no one else parked there the whole time we were there so go figure. Also the lock box to put the keys back was broken and would not lock. I did text them about this and did not get a reply till we were on the ferry heading home. I told them that we left the keys in the box anyway the closed it the best we could. But everything was great. but there was a bit of construction going on outside our window. The check in process was smooth and the apartment was clean. Unfortunately the entrance hallway reeked of urine and made us not want to invite anyone over to our place during our stay. One of the sinks in the bathroom wasn’t draining properly making it unusual even. There was also some kind of mix up and we had parking privledges revoked part way through our stay. The place is not worth the price. Too bad really because it is in a great location. The apartment was very clean, but it is about a 20-25 minute walk to go anywhere. It is on the bus route if you don't have a car which was my case. The picture shows a leather sofa. It was advertised as a pull-out, but it's not a pull-out couch, and it's not leather. Not a problem but what was there wasn't comfortable to sit on. The washer and dryer take about 2 hours to complete a single load, and the hand wand in the bathtub did not work. Overall I thought it was a little pricey compared to other properties in the general area. The street is quite noisy overnight with many large trucks and buses going by constantly. I wouldn't rent this far from downtown again. It would be okay if you have a car. There is parking behind the building. I am glad that you enjoyed your stay and please do come back and visit us again!